BAT property annotated by author. 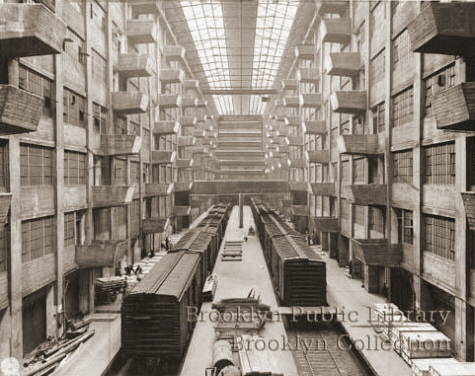 The Brooklyn Army Terminal, located in the 'Owl's Head' section of Brooklyn, began construction commencing in March 1918, for the purpose of supply base and depot. Construction was completed in just 17 months, by Septemer 1919,;and comprised of 5,000,000 square feet. The design of the facility was highly innovative for its time. The complex is constructed of girder-less, steel reinforced concrete slabs and included 96 centrally-controlled push-button elevators, the largest elevator installation of its time. Furthermore, the entire complex is interconnected, with three "skybridges" on the third floor linking the two main building structures. The larger of the two buildings featured a huge skylight-enclosed atrium equiped withn enclosed rail service, and the smaller building was joined to the atrium by three covered piers. The Brooklyn Army Terminal (shown above bordered in red), is part of the New York Port of Embarkation, and was formerly known as the Brooklyn Army Base (1918-1959), and was also known as the New York General Depot, and Army Transport Base. 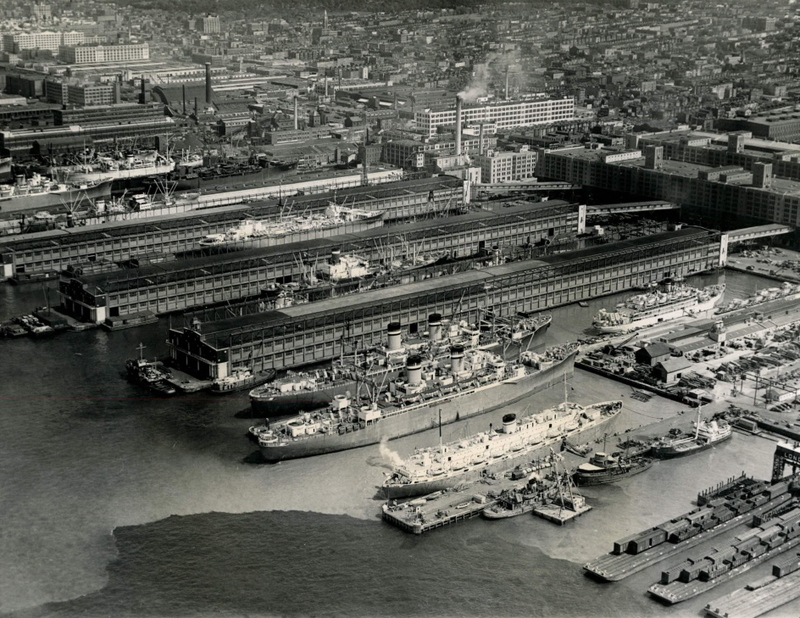 It was also known as U.S. Army Military Ocean Terminal. The Brooklyn Army Terminal remained active through the early 1970's, housing both military and civilian tenants. The City of New York purchased the property from the federal government in 1981 with the intent of renovating the property for intended use as a light manufacturing and warehouses, with the main entrance located at 58th Street and First Avenue. As of 1983, the Brooklyn Army Terminal has been listed on the National Register of Historic Places in 1983. The NRHP listing includes 11 contributing buildings on an area just over of 97 acres. "He said (Mr. Bush) that the War Department had decided that it needed a base such as the Bush Terminal furnishes and had consequently determined to take it. The facilities of the Bush Terminal will make it possible for the government to concentrate it supplies in the warehouse which are adjacent to the piers where the supply ships will be loaded." The structures of the Brooklyn Army Terminal was designed by none other that Cass Gilbert (architect of the Woolworth building among other structures). Gilbert, is best known for his Beaux Arts and Gothic building styles, was BAT’s principal architect. Gilbert also designed the Unite States Custom House, the Broadway Chambers Building, the Essex County Courthouse and the highly-acclaimed Gothic skyscraper, the Woolworth Building. BAT’s modern utilitarian style was markedly different from Gilbert’s previous work. Nevertheless, the structure has been recognized by modern architects the world over for its powerful aesthetic and highly functional form. During World War II; the Brooklyn Army Terminal was used as a Point of Embarkation for outgoing troops as well. BAT was most heavily trafficked during WWII, during which 56,000 military and civilian personnel were employed there. Over three million troops and 37 million tons of military supplies passed through the facility. Arguably the most famous soldier to deploy from BAT was Elvis Presley. He greeted fans and a dozens of photojournalists in September of 1958 when he shipped off from Brooklyn to Germany. 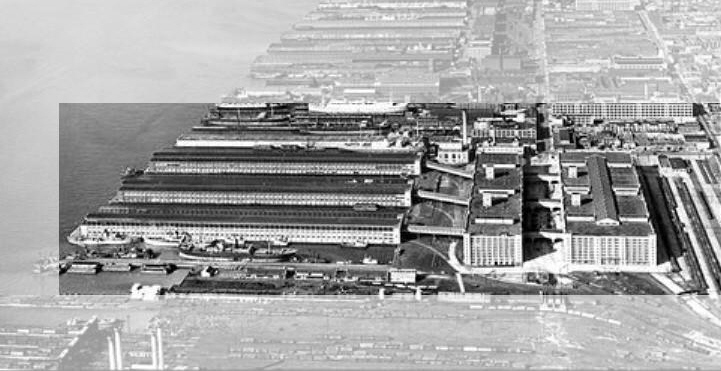 The following photo (looking north) shows the property and structure arrangement of the Brooklyn Army Terminal very well. It should be noted the railroad yard to the right of the photo (running vertical) belongs to Brooklyn Army Terminal. However, the railroad yard at the bottom and the float bridge gantries at the bottom left corner of the photo is the 65th Street / Bay Ridge Yard of the New York, New Haven & Hartford RR / Long Island Rail Road. Bush Terminal is at the top center of the photo. 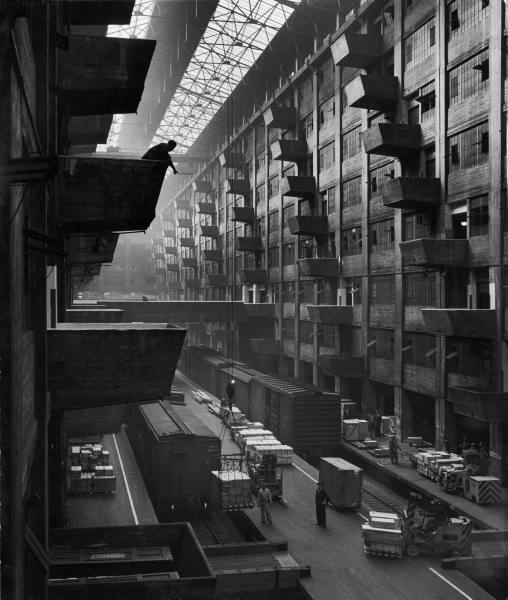 The Brooklyn Army Terminal is comprised of two huge warehouses and 3 covered multistory piers: Building 'B' (east and the wider of the two) and Building 'A' (west). Building 'A' is 980 feet x 200 feet wide and eight stories in height. Building B is 980 feet by 300 feet and eight stories high with an interior court 66 feet wide (with platforms and through tracks). Dimensions for the ancillary buildings are as follows: heating plant, 137 feet by 88 feet with 225 foot smokestack and the administration building with a huge cafeteria and kitchen area (204 feet x 64 feet). Building 'B' is connected to Building 'A' by three enclosed skybridges 150 feet long allowing matériel to be moved from building to building without being exposed to weather or hindering street traffic. Building 'A' is connected by skybridges 260 feet long to the three covered "double deck" piers which are 1300 feet long by 150 feet wide. To the south of the covered piers there was also a single open pier 1300 feet by 60 feet wide, but this pier was not connected to any of the structures. The skybridges from Building 'B' to Building 'A' and the skybridges from Building 'A' to the piers are in line with one another, and there are ninety freight elevators in banks of 6, 8 and 10. The elevators are of 10,000 lb capacity so freight movements between structures and piers is quick and efficient. Slip dimensions between the piers are 250 feet wide and the piers could accommodate at least 12 ships of 8000 ton capacity at one time, and all could be unloaded within 24 hours. It is stated that within 90 days from the day of opening, the BAT was filled to capacity! A short list of the items housed are: millions of uniforms, overcoats, hats, shoes, thousands of yards of khaki cloth, muslin, and fabric sheeting. Some small arms, medical equipment, artificial arms & legs, millions of pounds of bacon, sugar, canned fruits, fish, meats, vegetables, tea, coffee, prunes, beans, candy and other delicacies destined for fighting personal, were warehoused at the Brooklyn Army Terminal. After the war, a vast majority of these surplus items were released through the Government Public Market. One of the more somber and poignant tasks the Brooklyn Army Terminal has been used for, was it being the point of arrival of the remains of 5200 fallen servicemen from the European Theater of Operations after World War II. In November 1947, these soldiers were disintered from a cemetery in Belgium and were repatriated to the United States. 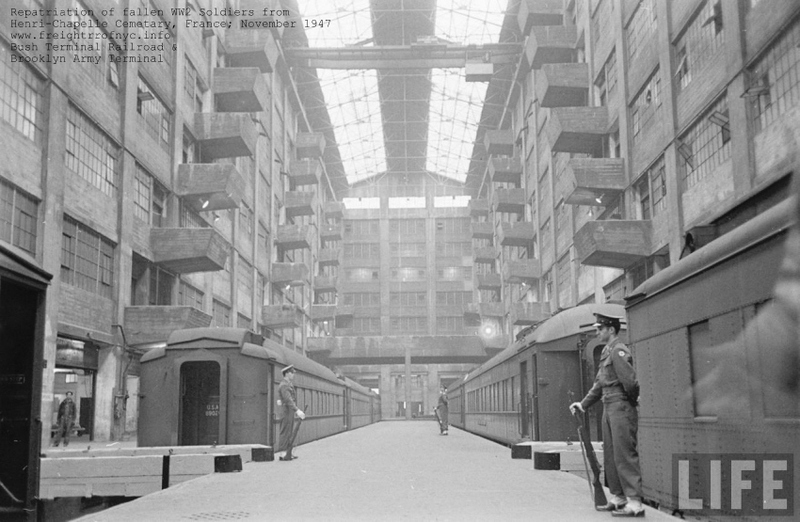 The ship carrying the caskets docked at the Brooklyn Army Terminal, and the caskets transferred to US Army Transportation Corps Mortuary Cars. Following the completion of loading, the cars were brought from the Army Terminal to Bush Terminal float bridges by a Bush Terminal locomotive and crew. Then, they were placed onboard Bush Terminal Carfloats #44 and 41 and were floated west to Greenville, NJ. Fortunately, almost all of the Brooklyn Army Terminal structures still exists to this day; but the piers have been torn down. The buildings have since been converted to civilian & commercial applications, including an annex to a local hospital. The following image is looking south along First Avenue from the main gate. Crossing First Avenue are the skybridges from Building 'B' (on the left) to Building 'A' (on the right). The arched bridge on the right side of the photo led from Building 'A' to the Administration Building. The following schematic, shows the Brooklyn Army Terminal trackage (in green) in relationship to the other railways in the area: Bush Terminal (in red) and the New York, New Haven & Hartford / Long Island Rail Road Bay Ridge Division (in brown) and via the Bush Terminal, the South Brooklyn Railway (in blue). Please keep in the mind the schematic is not to scale, and is a composite representation of all the railways and industries in the area throughout the twentieth century, although not all industries may have operated at the same time as others. 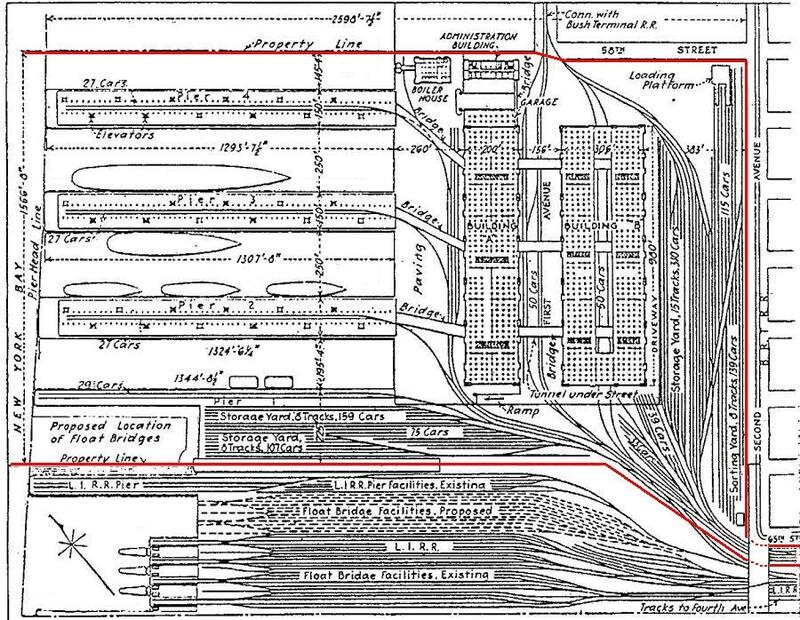 The Brooklyn Army Terminal utilized a track layout of modest proportions with a aggregate amount of trackage totalling 17 miles, and could house over 1,250 cars of 40' length and by referencing the map below, we can discern that the Brooklyn Army Terminal property actually contained nine railyards. 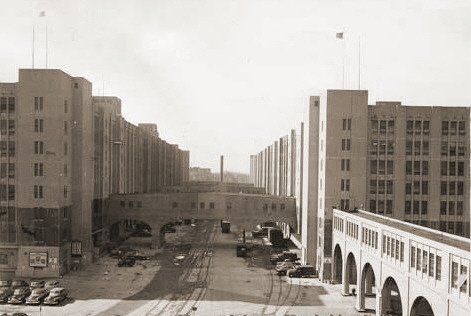 What make the Brooklyn Army Terminal unique in terms of railroad operations, is that one of the buildings constructed at the Brooklyn Army Terminal, "Building B"; incorporated two indoor tracks with platforms 740 feet long for a total capacity of 50 cars. This structure was also equipped with three overhead cranes with a clear height of 101 feet. The entire interior of this loading dock and trackage was covered by a glass skylight, which permitted operations in the daytime without the need for artificial light and in all types of weather. This indoor loading / unloading area also provided security for "sensitive" or secret matériel. The staggered platforms (balconies) seen on the left and right sides of the following two photos allowed for cranes to pick up or deliver items from various levels without interference from the floor above. Moveable bridges which spanned the individual tracks could be relocted anywhere needed, which provided greater loading & unloading flexbility. One these bridge can be seen immediately infront of the box car on the right track under the word "Public" in the watermark. an installation of the New York Port of Embarkation." "Off-loaded freight from box cars being hoisted up to jutting loading platforms at Brooklyn Army Base." Some research for this chapter by Paul Strubeck, reflects that the majority of car movements within the BAT were administered to by the motive power of the Long Island Rail Road, but little information and no photos have surfaced in regard to these Long Island Rail Road movements. Beginning in 1941, locomotive builders records reflect several entries for locomotives acquired for specific use at the Brooklyn Army Terminal. As far as can be ascertained, the BAT would employ the use of their own dedcated locomotives through the late 1950's possibly ealry 1960's, howevera an exact date on which BAT gave up their own locomotive operations current eludes us. 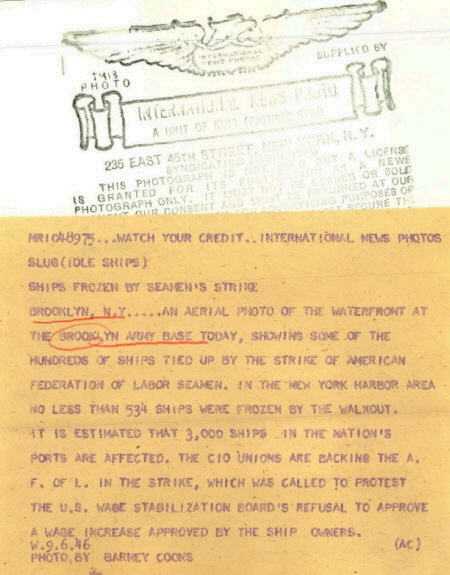 According to Joe Roborecky, when New York Dock assumed operations of Bush Terminal in 1972, New York Dock leased trackage rights within the Brooklyn Army Terminal from the City of New York of whom by this date owned the Brooklyn Army Terminal property. The builders records of the Plymouth Locomotive Works, show a 3 1/2 ton Model HL - Type 2 36" gauge locomotive, construction number 3213, built 5/17/29; being sent to the BAT from Raritan Arsenal, NJ. This locomotive is not marked for export either. Until this locomotives usage at the BAT can be proved or disproved, I have listed it for reference. As all trackage as constructed and in place within the BAT, is of standard gauge width, it is left to ponder why a narrow gauge loco was sent to the BAT, unless there was a narrow gauge trolley system set up in one of the warehouses. 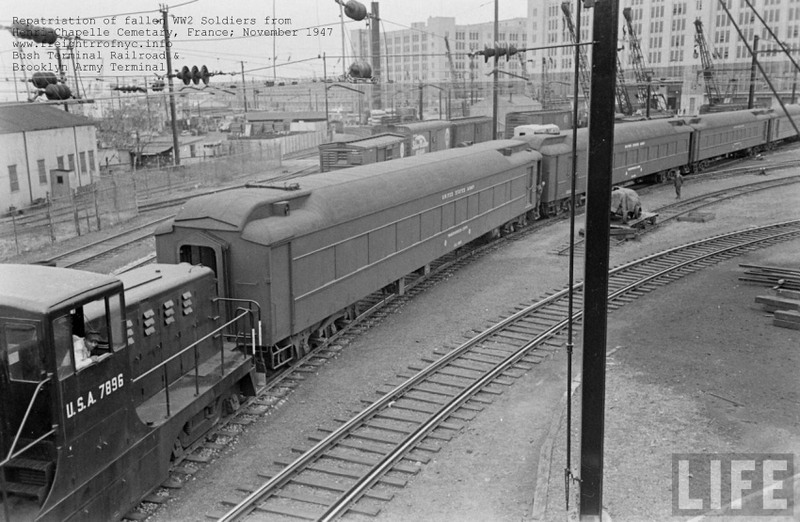 "All tracks within fence - property of U.S. Army, who does own switching with its diesel loco"
In either case, all evidence surfacing now points to the fact that Brooklyn Army Terminal did indeed have a locomotive on premises to switch cars in their railyard. .Lapse forward to 17 June 2011, when Paul Strubeck sends a link pertaining to a series of image taken when 5200 fallen servicemen were repatriated from a cemetery in Belgium to the United Stated. 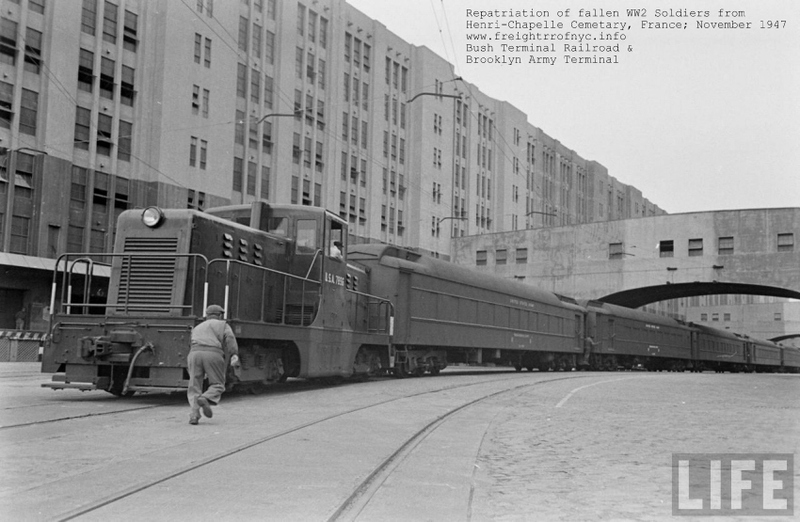 In several of these images, a U. S. Army locomotive is seen shifting the US Army Transportation Corps Mortuary Cars the Brooklyn Army Terminal! 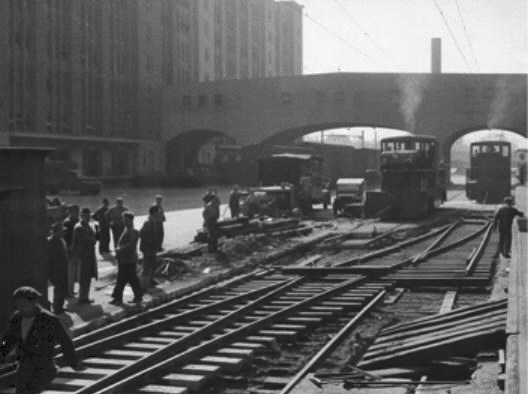 Yet another revelation, seen in the images below; is that the overhead catenary from New York, New Haven & Hartford / Long Island Railroad's 65th Street Yard leads into the Brooklyn Army Terminal and even partially northward up First Avenue (completely within the Brooklyn Army Terminal property). Undoubtedly, this would allow for NYNH&H RR overheead electric powered locomotives to interchange within the Brooklyn Army Terminal. Note the overhead catenary permitting NYNH&H RR electric locomotives to venture this far into BAT property! Thanks to the research and generousity of John Taubeneck, he has furnished a roster of both GE locomotives and railway cranes of assorted manufacturet that are list by the Brooklyn Army Terminal. It is confirmed that locomotive #7864 and #7896 were in fact assigned to and operated at Brooklyn Army Terminal. #7449 may also operated at this location as well. These three locomotives are highlighted in the table below. 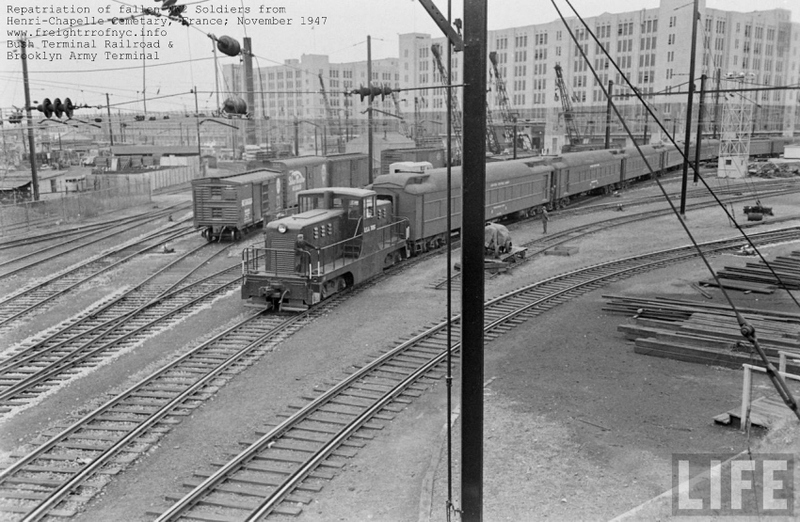 Other locomotives listed may have simply been ordered and shipped to and from the Brooklyn Army Terminal for forwarding to their final shipping destination. [a] Fate - Root - Heath / Plymouth Locomotive sales records indicate this locomotive was ordered by the Raritan Arsenal, Metuchen, NJ, and shipped to the Brooklyn Army Base, Brooklyn, NY. [b] Fate - Root - Heath / Plymouth Locomotive sales records indicate these two locomotives were ordered by the War Department, Washington, DC ansd shipped to the New York Port of Embarkation, Bay Ridge Station, Brooklyn, NY. These locomotives may have been for export to an overseas military facility. John Taubeneck also furnnished railway cranes that were shipped to the Brooklyn Army Terminal. In two of the Life Magazine images above, seven of the cranes can be seen in the background behind the train, with their booms in upright position. By no means should it be considered this roster complete, as this list is only from one (Ohio Locomotive Crane) of many equipment manufacturers. 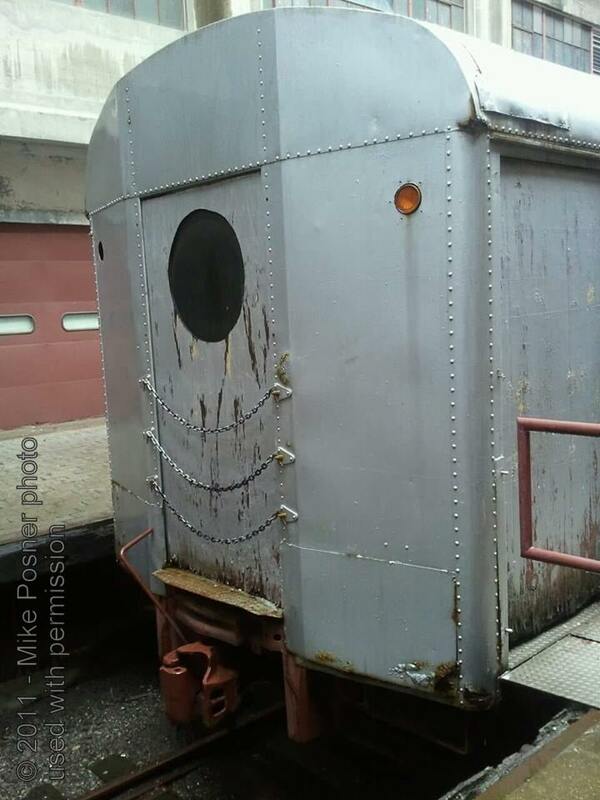 Inside of Building B, are two Pullman Standard passenger cars from the Long Island Rail Road. P72's were built by Pullman Standard from May 1955 to March 1956. Urban legend has it they were used for an Elvis Presley movie. They were NOT. They were not placed in Building B until 1985. 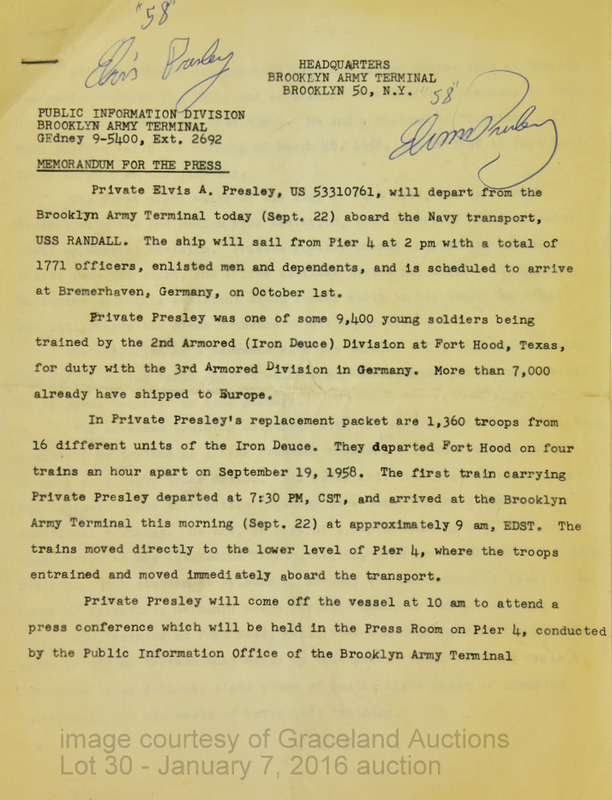 So, we know the train carrying Mr. Presley pulled directly into the ground level of Pier 4, at which the troops detrained and boarded the USS General Randall (troop transport with the designation P 115) at 09:00. Then, Mr. Presley disembarked from the ship at 10:00; holding a 40 minute press conference was held in the press room of Pier 4. On conclusion of that, he reboarded the U. S. S. General Randall, and the ship sailed at 14:00. Other accounts of the day also state he did not enter Building B and the Long Island Rail Road train carrying him and other soldiers discharged directly onto the pier. However, it is known that the vessel General Randall had been used in 1956 in the war film "Away All Boats". So, personally, I think it is the convolution of two seperate events that have lent themselves to the urban myth the cars were used in an Elvis movie.. Returning to those two passenger cars in Building B; both are bar / generator cars. I asked Ben Schaeffer, and he was able to shed some light on the matter. One of the two in Building B is definitely LIRR 2104, as the numbers can be seen beneath the coats of paint; as witnessed and recorded by Benjamin Schaeffer. As the Long Island Rail Road only had four numbered bar/generator cars numbered 2101, 2102, 2103 and 2104 make their history fairly easy. So, I referenced Steve Lynch's website on the Long Island Rail Road, and was able to ascertain the following information from several different pages, which I collated and consolidated from those entries to here. Bar Generator cars, Class BG72B in the 2101-2104 series, which had a large diesel generator installed inside a large compartment in the carbody, with a bar in the other end of the car located mid-train. These cars had large vents in one side of the car body. These were rebuilt from MP72T coaches while the railroad was converting to push-pull operations. The primary purpose of these 4 cars was to provide HEP (600 VDC) via trainline to push-pull equipped coaches in trains that did not have a cab control powerpack unit or an MP-15AC to provide HEP. 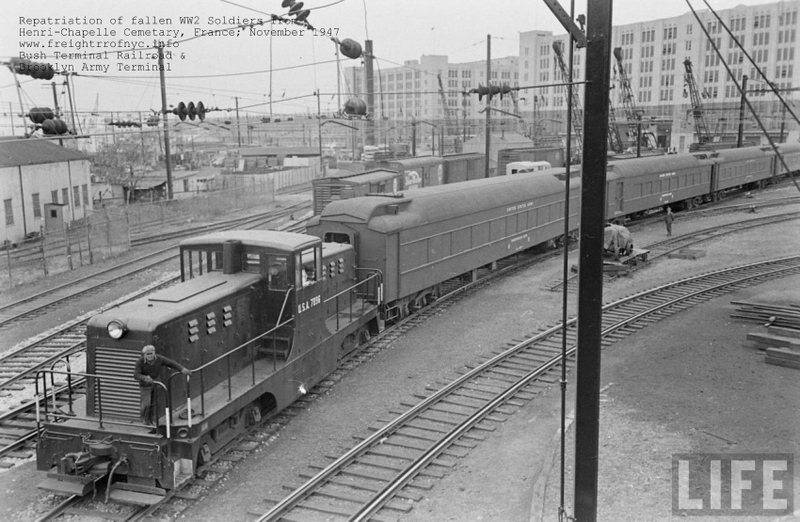 Each Bar / Generator cars was equipped with two gensets. The engines were Detroit 8V71's rated at 318hp equivalent to 237 KW electric power output. So, each bar / generator car could supply 474 KW of power for the HEP trainline. It is understood the bar / generator cars did not stay in service long as the added weight of the generator sets and the constant rocking of the train made the floors sag, as well as cause the outer wall of the cars to eventually start to bulge out. They had to be taken out of service for safety reasons and all are believed to have been retired by 1979. Originally as built and delivered they were painted in dark gray. 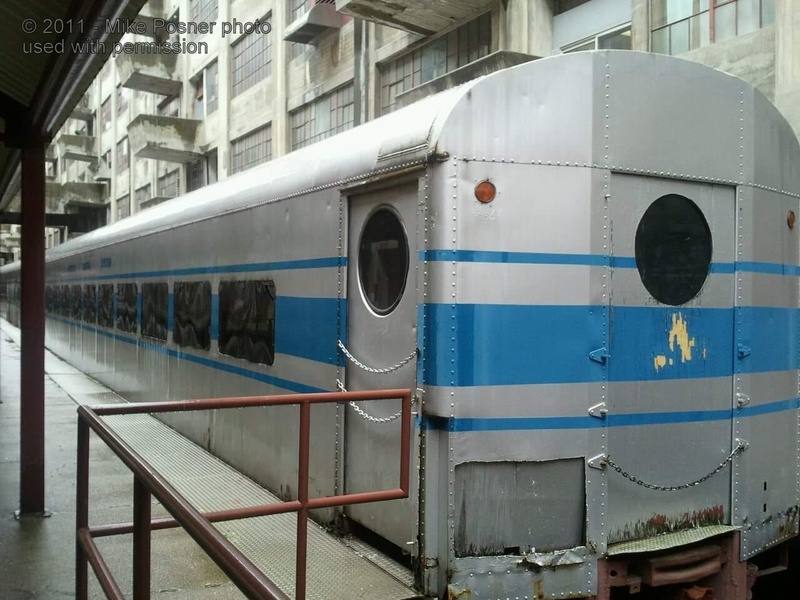 During the MTA era they were repainted Platinum Mist with Blue window band and were in such livery when they were converted in 1976. Ben remembered that Robert Diamond (of Brooklyn Historic Railway Association / Atlantic Avenue Tunnel fame) had been involved with the cars at some point and contacted him on his own accord. Bob had the following information to offer. There were plans between an individual (name not remembered, and not R. Diamond) and Ray Aufiero of the New York Cross Harbor Railroad to organize a dinner train that would operate along the Bay Ridge Branch utilizing these cars and New York Cross Harbor motive power.For as yey unknown reasons, that plan fell through. The cars were then put in Building B in 1985 by the New York City Economic Development Corporation. There was talk they were to be used as a cafe / restaurant. 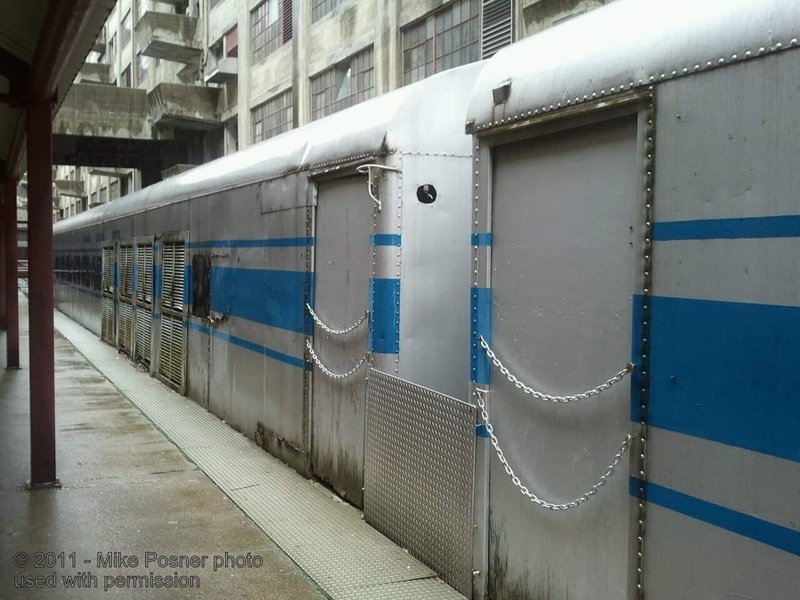 Bob was contracted to paint the blue & silver scheme and "Brooklyn Central Lines" as seen in the following circa 2011 Mike Posner images below. That plan failed to materialize as well. One of the two generator units from one of the cars was acquired by Bob to use to power his equipment stored at New York Cross Harbor. Then there was a plan to make these cars walk through historical displays pertaining to the Brooklyn Army Terminal. Another use stated was as office type accomodations for the contractor(s) hired to renovate some the Brooklyn Army Terminal buildings. Being they had their own power, made them self-sufficient. Bob also mentioned that they had consecutive numbers. As 2104 is a confirmed number by Ben, that would make the other 2103. What ever their intended use was for, came to naught and they were abandoned in situ. Then the access doors on the buiding face was bricked over, so they are truly captive within Building B. Any ideas or rumors of removing them will require either tearing out the brick wall or cutting them up in place and removing them in pieces. They have also since been painted brown with gold lettering "Brooklyn Army Terminal".